There are several opportunities during Downrigging Weekend to tour and sail on some of the Tall Ships, schooners, and boats that are in port for the festival. Schedules and online ticket purchasing information for tours and sails are listed below. After the above-listed dates, tickets are not refundable but may be transferred to another name(s). Tickets will not be refunded due to illness, family emergency, etc. Ticket holders should be aware that Downrigging Weekend Public Sails are an outdoor activity. Sails will likely proceed in the event of rain or colder weather. As a rule-of-thumb, if the weather would permit an NFL team to play football, the Downrigging Weekend Fleet will likely sail. Passengers are encouraged to dress appropriately for the weather! Downrigging Weekend Sails will only be cancelled if weather conditions are deemed dangerous by the licensed captain of a participating vessel. Due to the different sailing characteristics of the participating vessels, this decision may not be uniform among the fleet (i.e. some vessels may cancel while other sail). In the event of a cancellation, ticket holders will be informed as far in advance as possible and will automatically receive a full refund. 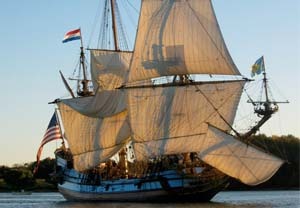 The KALMAR NYCKEL is a re-creation of the first colonial Swedish settlement ship to arrive in America. Launched in the Fall of 1997 this ornately carved 17th century reproduction ship sails seasonally visiting ports from the Mid-Atlantic through New England while carrying out her mission of goodwill and providing educational opportunities for school children. Please note there is an additional service fee charged per ticket. 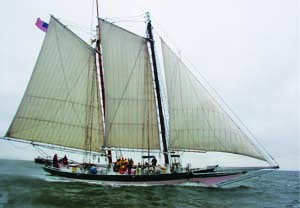 VIRGINIA is a reproduction of the last all sail vessel built for the Virginia Pilot Association. The original ship sailed for the pilots from 1917-1926, training apprentice pilots in seamanship and navigation. The reproduction, built in Norfolk between 2002-2004, is also used as an educational platform. Her programs include courses in maritime history, marine science, maritime literature, and team-building for both students and adults. The ship has sailed as far south as Trinidad, east to Bermuda, north to Prince Edward Island, and all along the Atlantic Coast of the United States. The square topsail schooner LYNX has been designed and built to interpret the general configuration and operation of a privateer schooner from the War of 1812. Lynx sails as a living history museum and as a floating classroom for the study of historical environmental and ecological issues. Living Classroom Foundation that teach students about the history and environment of the Chesapeake. 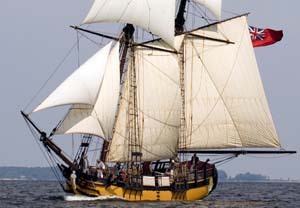 SULTANA is a reproduction of 1768 namesake used by the British Royal Navy to enforce the notorious tea taxes in the years preceding the American Revolution. Built in Chestertown and launched in 2001, the new SULTANA’s mission is to educate students of all ages about the history and ecology of the Chesapeake Bay. The 1901, 72-foot oyster-dredging skipjack ELSWORTH is one of a handful of skipjacks remaining on the Chesapeake Bay. 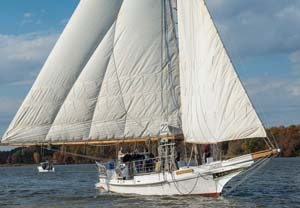 The ELSWORTH is currently used to provide live-aboard educational programs in environmental science and Chesapeake history.